Craig Titus and Kelly Ryan were stars in the world of professional bodybuilding. The married couple posed for magazines and competed at events while trying to turn their chiseled muscles and crafted images into fame and fortune. It all went to ashes in Dec. 14, 2005, when the charred corpse of their live-in personal assistant, Melissa James, was found in Ryan's burned-out red Jaguar sedan off a remote desert road outside Las Vegas. "It's a situation where two very successful people flamed out in America's Sin City," said Glenn Puit, a former newspaper reporter who wrote a book about the case. "That's not sensationalizing it," Puit said. "You've got two beautiful, popular people charged with murdering a woman in the most horrific manner possible." Titus and Ryan were arrested in a Boston suburb after a nine-day nationwide manhunt. Ryan was getting her nails done at a Stoughton, Mass., salon while Titus waited outside. Titus, 43, pleaded guilty late Friday to second-degree murder. Ryan, 35, pleaded guilty to arson and entered an Alford plea to battery with a deadly weapon resulting in significant bodily harm. The Alford plea means Ryan didn't admit guilt but acknowledged that enough evidence exists to convict her. Both Titus and Ryan were originally charged with murder with a deadly weapon in the case. James had moved from Lambertville, N.J., in 2005 to live with the couple. "We've always believed that Craig Titus was responsible for Melissa's death and Kelly was primarily involved in covering up the death," said Deputy District Attorney Robert Daskas. "Whether we obtained those results by a jury verdict or guilty plea was unimportant to us." Titus also had a drug history. He served almost two years in federal prison after being convicted of selling Ecstasy in October 1995. 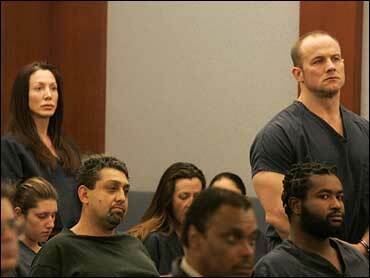 He got probation, but it was revoked when he tested positive for steroids. He was released in April 1999. Friends told police that Titus and Ryan used the prescription painkiller OxyContin, and witnesses testified that Titus once bought $500 worth of morphine. Both Titus and Ryan told police they injected the synthetic opiate Nalbuphine, and that Ryan tried methamphetamine. "Defendants admit to steroid use and there are steroids within their house," prosecutors say in pretrial court documents, which also raise the issue of steroid-induced aggression sometimes called "'roid rage." Prosecutors accused them of using a stun gun, administering morphine or a related drug, and asphyxiating or suffocating James with a fabric or wire around her neck. However, the cause of her death was ruled "undetermined" by the coroner. Titus also told police he'd had an affair with James that Ryan didn't know about. Sentencing was set for July 18. Titus faces 15 to 55 years in prison. Each of Ryan's charges carry sentences of two to 15 years in prison, or the judge can give her probation.